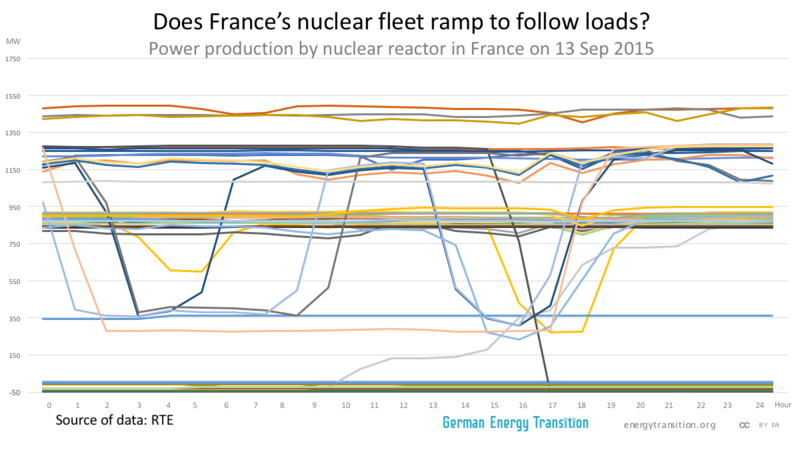 Does the French nuclear fleet ramp to make space for solar and wind? In recent months, a slew of papers have been written about how nuclear is a great complement for solar and wind. Today, Craig Morris investigates one brochure by French utility EDF to verify / falsify that claim. Over the years, my friends in the nuclear camp have repeatedly challenged my contention that nuclear ramps the worst of all conventional sources (alongside coal, oil, and gas plants) by sending me charts of a single reactor ramping dramatically. My assumption was always that the single reactor in question is being sacrificed to keep the rest of the fleet from having to change much. Recently, I had the time to delve into the data to verify that assumption. Let’s start with one of the charts. 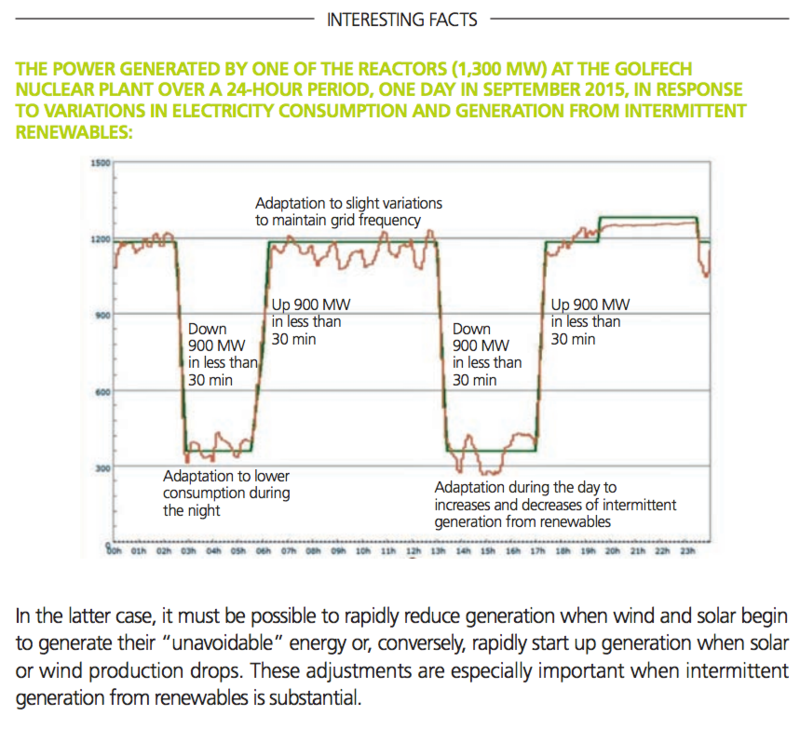 It’s taken from this PDF, an info brochure from EDF. The strange thing is, however, that loads do not look like that; they don’t dip at night and in the afternoon that much. So I took a look at the hourly production data for 2015 (available here as a zipped spreadsheet big enough to freeze your computer). The production data by reactor show that only five of the country’s 58 reactors moved in such a manner that day (with one replacing another in the afternoon as well). Below is the entire fleet stacked. Again, there is almost no movement. For ramping to accommodate fluctuating wind and solar, the entire conventional fleet needs to dip down low on a daily basis. German power plants fired with hard coal are already doing that, as the next chart shows (for the same week, but from 2016). Clearly, these coal plants adjust their output significantly; this is not a case of a few being sacrificed so the rest can run relatively unchanged. 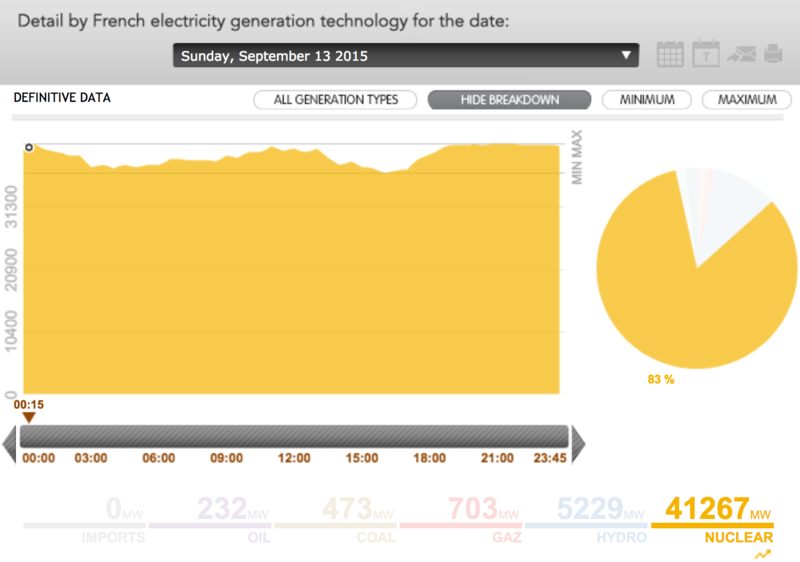 Yet, hard coal plants are not held to be particularly good at ramping. One would expect gas turbines to do so. But Germany’s gas fleet is already pushed down to its must-run level (especially for cogeneration, meaning that these turbines need to keep running to cover heat demand; power is a by-product). Lignite and nuclear are touched less often, as we can see from the data for December 2016, where gas turbines (orange area) do indeed ramp up along with hard coal during a Dunkelflaute around Christmas break. In contrast, lignite and nuclear run nearly full-blast until low demand meets great wind power production at the end of the month. That timeframe may be the period of the greatest load-following in the history of any nuclear fleet worldwide – and yet, it’s not even close to what will be needed for wind and solar. Over the month, the fleet does indeed go down from just over 10 GW to around 6.5 GW, primarily because three of eight reactors went offline. From 24-28 December, there is considerable ramping, but also one reactor shutting off. In the end, the five remaining reactors ramp down to 4.5 GW and back up to 6.5 GW (close to 100% of rated output) during those days, a reduction of nearly a third. Wind and solar will eventually push the conventional fleet down to 0% on a daily basis, so we need backup plants that can do that and come back up again. What’s more, proponents of nuclear make claims about a technology’s potential based on the exceptional performance of single units. Little wind or solar fluctuations to accommodate. What’s most surprising to me is that so few people bother to check the data. EDF obviously didn’t for its brochure. Not only against wind, but also against solar — or against nuclear if you prefer wind and solar. My point is that the two (nuclear vs. wind+PV) are incompatible. Whilst Golfech was specially designed for ramping most other atom power aren’t. Golfech was not designed to ramp for the accommodation of REs but to back up the slow but sometimes very suddenly reacting rest of the atom fleet. 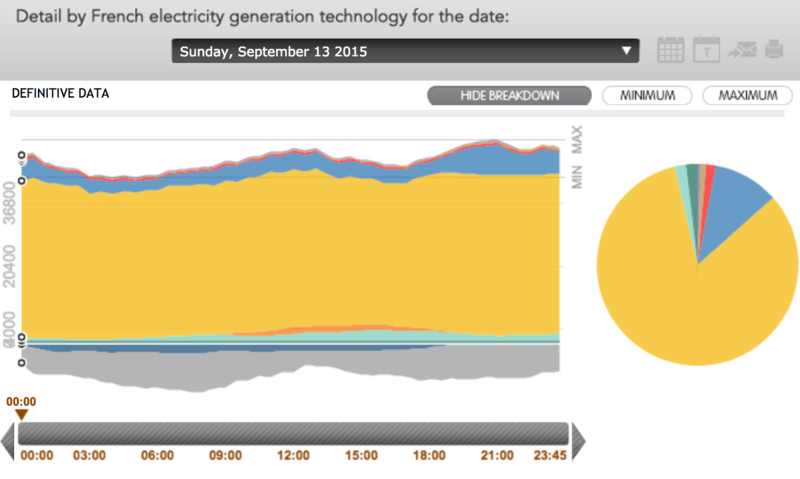 If these do ramp down – as shown in the German data – this is done by blowing the steam into the atmosphere instead of trough the turbines: note how fast they can ramp down in Germany but how long it takes to bring them back to 100%. Golfech is getting old, the stress is to much. Even radioactivity was released (from the primary circuit? )last autumn. Is that a typo where you write: Golfech 1 allegedly drops 900 MW to account for 600 GW of “unavoidable renewables.”? 600 GW looks way too large. Should it be 600 MW or 6 GW? This is technically wrong, steam is only released in emergency cases and not during normal operation. The boiling water reactors as used in Germany ramp down by inserting the control rods and not by releasing steam. Previous PostThe US (and Australian) nuclear camp critiques studies for 100% renewables. Without reading them.